It’s alright – we were a little confused too. Björk’s last long-player, Medúlla, split opinion in a fashion quite unlike any of its preceding album releases. The Icelandic avant-pop queen had taken a drastic sidestep, and not everyone in her audience was willing to follow her lead into the unknown. The aforementioned last-long-player-proper, released in August 2004, was an experiment of sorts, an intentional distancing of its maker from her past work. Made entirely from vocal samples, some straight from the throat and others distorted through a sequence of electronic tricks and twists, the album was a far cry from the enveloping intimacy of Vespertine, Björk’s album of 2001 which rightly topped DiS’s Our 66 poll last year – click here to see the run-down. Volta finds Björk taking a few steps backwards in order to leap forward – the new album, out on May 7, possesses its fair share of Vespertine and Homogenic echoes – Homogenic was her third studio LP, remixes aside, released in 1997 – but manages to feel entirely fresh at the same time. Propulsive, attention-grabbing songs sit shoulder-to-shoulder with tracks that are so soft and delicate the slightest surge in volume could shatter them irreparably. Tracks produced by Timbaland – boisterous and full of fun – jostle for space with songs guided by previous collaborator Mark Bell, who worked with Björk on Homogenic; he lends the album the tenderness that balances its tumultuousness. It mixes subtlety with the exact opposite quite brilliantly, and features Antony (and the Johnsons) Hegarty as a guest vocalist on two of its ten tracks. Ahead of Volta’s release, DiS was fortunate enough to be given the opportunity to send some questions the way of Björk. Today, we received some answers. Which was rather more than nice. One Little Indian are so cute. They always feel that ‘my latest release is the most commercial to date’. It’s good to know they have hope in me. But you’re right – emotionally I wanted this album to start with urgency, the sort of ‘go to the top of a mountain with a flag and a trumpet’ demand for justice. I really don’t know what is pop and what is not. The meaning of the word comes from folk, or people, and therefore I felt at moments that Medúlla being only done with the human voice, which we all have, [was something] that everybody could join in. I feel materialism has really distorted that word, and it has changed its meaning into ‘sellable’, not ‘music of the people, working-class style’. Although brash and boisterous at times, Volta also possesses moments of wonderful introspection, passages of delicacy such as ‘I See Who You Are’. Although you stated in an earlier interview that you wanted Volta to be “fun… full-bodied and really up”, was it also important to retain some of the vulnerability, the intimacy, that was so prevalent on Vespertine and Homogenic? Thank you. Yes, of course. I’ve noticed though, in some online features about the album, where I was describing the first single journalists kinda used that for the whole album. Volta features a wealth of contributors: did you have a wish list of collaborators, or did songs that you’d penned just seem to suit particular individuals, who you then approached? For example, was ‘Dull Flame Of Desire’ written with Antony already on board, or was he approached after the song was in an almost-finished state? You recorded a number of tracks with Timbaland, three of which are on Volta – will the other tracks ever be released? The songs just kinda grew. And then I bumped into people and they joined in. Each track has different story, and it is hard to not over generalize. ‘Dull Flame…’ was not written with Antony in mind, but we had been singing together for a while and I felt we both were too shy and singing too sweetly, perhaps worried we would step on each other’s toes. So I woke up one morning with this melody I had written earlier, in the middle of the night, and a poem by a Russian poet from the 19th Century and said: “Okay, no more sweet stuff. Now we are going to belt it out, diva style. We can sing words by a third party, so it is neutral – not my world and not your world”. Then we sang and improvised from that melody for a whole day and I later spent few days editing [the song] together, focusing on the emotional chronology we went through. I don’t think the other Timbaland tracks will come forth. Antony remarked in an interview, post-collaboration, that you were “really inspiring” and “like a master”. How do you fare at receiving compliments from fellow artists, musicians who are your peers? Are compliments from likeminded artists more special, maybe, than a glowing review written by a stranger in a foreign magazine? Do you draw inspiration from peers, or are your muses too myriad to put succinctly into words? Hmm, good question. Of course, to hear something that lush from Antony is going to make me weak in my knees, but overall it’s kinda unpredictable. Sometimes a stranger can be more honest because he or she doesn’t know you and they hit the hammer on the head (this is more constructive criticism that I’m describing here, probably), and the other way round. I guess it depends totally who it is – sometimes you kinda mirror out the answer you’re looking for and ignore the rest, if you know what I mean. But to be honest, overall, doing what I’ve done for so long, the main floor you stand on has to be [based on] your own positive and negative remarks. The rest is bonus. Otherwise you’d tumble too often. With Drawing Restraint 9, because it was a soundtrack album, it was such a different project – to enjoy it you kinda had to be into Matthew [Barney]´s stuff, the filmmaker, and see the film as you listened to the music. So I didn’t really take the comments on it that seriously. Also, there are complications where people listen to it in context to my earlier stuff and try to find continuity, which of course doesn’t make sense. But overall I don’t believe in the artist that does what he or she does only for power and people, and to be famous and all that stuff. I also think, though, that it is just as bad to totally isolate yourself from the world and people – then the love starts to go out of it. So I try to be somewhere in the middle; there is no one answer. You have to tightrope walk all the time, to keep yourself open enough to communicate and retreat enough to plant new seeds and grow. It is going to be 10 brass musicians (Icelandic girls), Mark Bell on beats, Damian Taylor on electronics, Chris Corsano on drums, and Jónas Sen on keyboards. So 15 in all, including me. We might come back in December and do some shows in England – we have to go to South America and other stuff first. How difficult is it, now, balancing your career with your family life? With Volta looking likely to rekindle many critic’s love affair with Björk, are you bracing yourself for a full year of interviews? Do you worry, ever, that paparazzi interest in your personal/social life could escalate to how it was in the ‘90s? You’re sometimes, still, perceived as something of an eccentric, an artist who can be hard to stomach at times. Is this something that, essentially, you strive for though, to be absolutely removed from what is the norm at any particular juncture of your music career to date? Do you think any of your solo records have emerged at a time when that music – the music on said albums – was vogue in any way? You won at the BRIT Awards in 1994, 1996 and 1998, but not since – is that an indication that tastes, certainly within organisations like the BRITS, have become safer, flaccid and, sadly, devoid of imagination? Is there a lot of modern pop music exciting you right now? Hmm... that’s a big question touching on many subjects. I have been asked questions a little like this [before, and] the only angle I can get on it is that I am aware that there are periods when I am an extrovert and there are periods when I am an introvert. It’s a very natural progression, in and out, kinda like the tide. And when I am at my most introverted it probably goes in hand with developing a deeper contact with my idiosyncrasies; when I am very extroverted I am curious about other people, so I reach out way more. To be honest I don’t have a clue when I’m “in” or not – that’s way too abstract for me, too close to home, and the journalist’s job. The same goes for the integrity of the BRITS – I really am not the right person to measure that. How did being recognised for your role in Dancer In The Dark affect you? Was it pleasing to be approved by a group of people unrelated to what is, essentially, your day job? I read that you turned down a role in Michel Gondry’s The Science Of Sleep – was this in order to focus solely on music for the time being, on Volta and all the promo activity around it, or are you finished with acting? That is some sort of misunderstanding. There was, in the beginning, a chance I would play the main role in Human Nature, Michel’s first film (released in 2001). Parts of it were related to me – I had been going on about it for years with my visual collaborators, if i could be all hairy, and the whole Isobel story: being born in nature and not fitting at all into urban situations. But it was important for Michel to claim his independence at that time and I fully understood, so we both thought it would be good that he would do something without me. At that point we had done six videos together, but I was really relieved because it would have been hard to turn a friend down. It really isn’t on the top of my list to act – it is kinda at the bottom. Wikipedia.org lists your genres as, and I take a deep ‘breath’: pop, trip-hop, rock, jazz, ambient, electronica, dance, alternative, hip-hop and experimental. Does this widespread array of diverse pigeonholes serve as a plus or a minus, ultimately, for a commercial artist such as yourself, or does the nature of your music – music that varies so wonderfully from album to album – naturally avoid simple categorising? Would you ever be content, at all, to be retrogressive with your writing? Just how do you begin each album, anyway: is it a case of ignoring, totally, what came immediately before, or is each step Darwinian in evolution? I’m totally run by impulse, so it is not so planned. I already feel tied down in so many ways that have nothing to do with me. My voice will always sound the same, I will always be the same person, from Iceland, a woman; I have limits to my energy, and I have to try to press the record button in moments of spontaneity and do concerts on already agreed time and so on and so on. Compared to that, changing from strings to brass in one album or from a whisper to a scream on another seems like nothing. I’m just doing my best to escape boredom. Finally, and to return to Volta: the album doesn’t sound like the work of an artist nearing the end of their career at all; it’s fresh, innovative, entirely modernist despite the many echoes of indigenous music past. How long do you see your music career lasting for? Can you foresee a time when retirement might be an option worthy of consideration, or are you unable to rid your mind of thoughts of new arrangement ideas? I feel it is healthy to keep busy at stuff. Nature made man that way, so I’ll probably be noodle-ing until old age. Volta is released via One Little Indian on May 7; ‘Earth Intruders’ is available on digital download now, and physically from May 21. The album can be pre-ordered digitally from here. 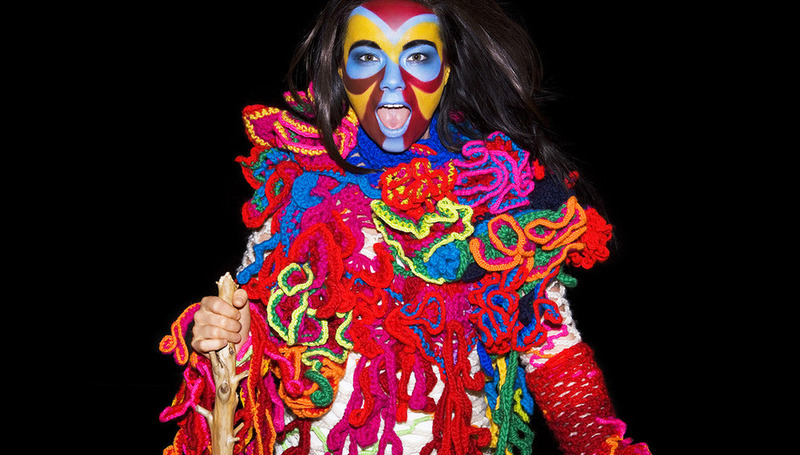 Björk is looking for a fan to direct the video to her next single, ‘Innocence’. Click here for details. For her MySpace page with all confirmed live dates, click here.